This is Tikahiri. They define their style as “Paumotu Goth“, and they are living legends in French Polynesia. It mixes rock, classical instruments and polynesian lyrics in a 100% original and explosive combo. Tikahiri was created by two brothers, Aroma and Mano Salmon, born and raised on a small atoll in the Tuamotu archipelago, in French Polynesia. They spend their days living like authentic island boys, fishing, rowing their canoes and fighting. Their dad also had the best rock collection on earth, and they got raised in a culture completely foreign to their friends… But it stick to them. Now they are adults and very successful tatoo artists (one of their client just won Miss Tatoo France). Their dark taste and sense of humor is more seducing then ever and they created their own group of goth/metal rock with 3 other musicians, adding cello, piano and drums to the comp. In Tahiti, the brothers Salmon are now living Rock Gods. 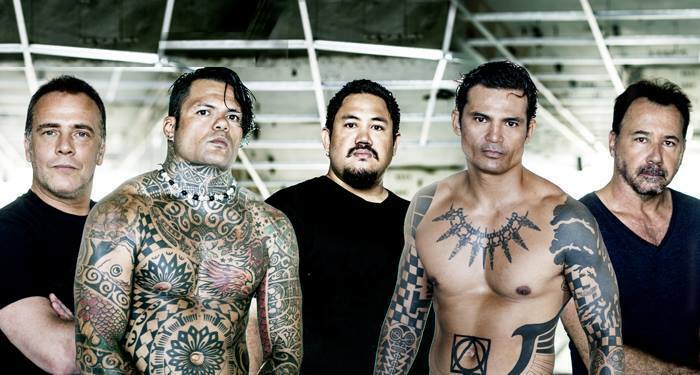 They developed their own style, dubbed “Paumotu Goth”, and started singing hard rock lyrics written in the Paumotu language of their child and teenage years. Their first public concerts in the 90’s got banned and picketted by the local churches. But they still released three albums in Paumotu and a new one, Son of Sun, released in 2015 with English lyrics. Of the new album, the group said it would be “more accessible to the general public and international audience”. They paid everything from their pocket and hired a very famous French producer to try and find and international public, and good for them because it did work and attracted some attention. But honestly, this last album is overproduced and does not do justice to the genius of these guys. Just watch a few of their clips… Good news then that the group, coming back from a big tour in Japan, is working on two new albums, one in English and one in Paumotu, that will be truer to their savage nature. We can’t wait !